Complete dietary food for horses, containing vitamins and minerals. Equitop Forte is a widely used additional supplement for any types of horses from young to old. Contains appropriate concentration of calcium and phosphorus and many vitamins necessary for a healthy horse. Contains biotin to stimulate horn growth. Complete dietary food for horses, containing vitamins and minerals and suitable for horses and ponies which are in high demands, both in sport and in breeding, in stressful times, recovery periods and during shedding. Dose is based on a horse of 500kg added to normal daily ratio. 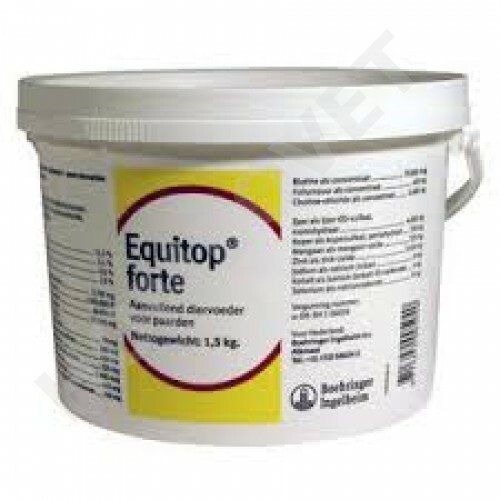 EQUITOP FORTE 1.5 kilo by Boehringer Ingelheim. vitamin A as concentrate 1000000 I.E. vitamin D3 as concentrate 40000 I.E. Se as sodium selen 8 mg.
Dextrose (glucose), calcium carbonate, dicalcium phosphate - phosphate, sodium chloride, magnesium phosphate, vitamin, trace element. Calcium-11, 2%, phosphorous 2.1%, sodium 2.6%, magnesium 1.5%.